Like everyone in America I remember exactly what I was doing on the day of 9/11 ten years ago. I had just sent my first grader off to school on the bus that picked her up at the end of our driveway in New Canaan, Connecticut, a town about 40 miles outside of New York City. My 2 year old son and I went to meet a friend to go walking. It was a little before 9 am and as Maureen and I pushed our jogging strollers and talked, a man driving by stopped to ask us if we heard what just happened. By the time we made it back to the house and turned on the news the second tower had been hit. It was impossible to reach anyone by phone...you heard a busy signal as soon as you picked up the receiver of your land line. Trains stopped coming into our town and eventually we went to the Stamford station to wait for my husband. I was lucky...I knew my husband was in his midtown office and was safe, but many people were not so lucky. As we waited standing on the platform, we watched as people poured out of trains. No one made eye contact, two young men were covered in ash and my first grader had no idea what to make of this....did any of us? In the days and weeks that followed the attacks it was amazing to see everyone coming together. ...as neighbors, New Yorkers, as people who cared about America. 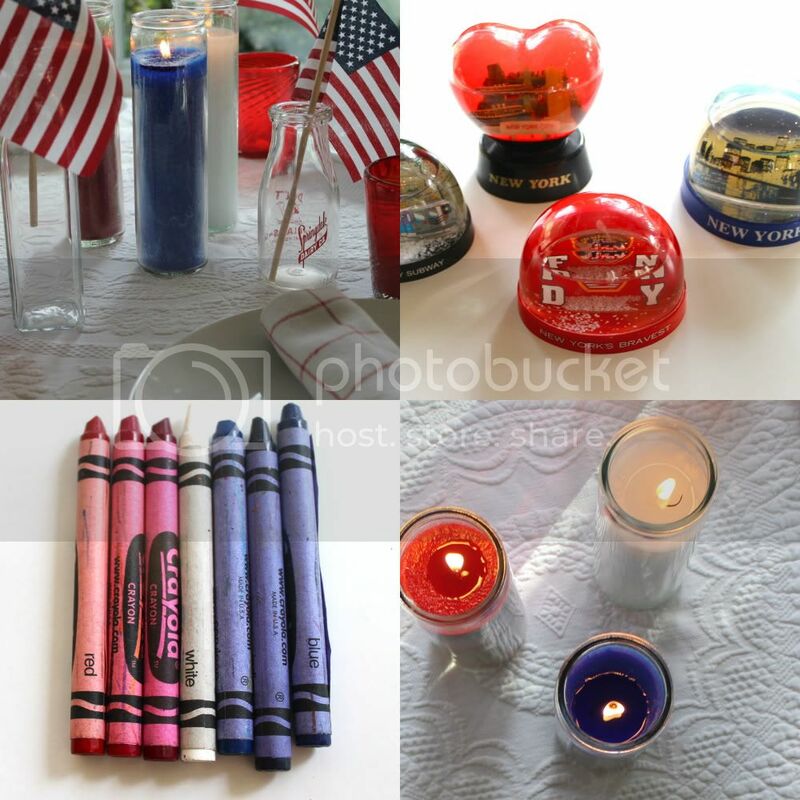 Everyone displayed an American flag and not just like the 4th of July. People displayed huge flags on the side of their homes, roof tops, the side of barns...they were everywhere. Businesses all over NYC and the tri-state area displayed the I heart NY poster designed by Milton Glaser, only he modified it and put a smudge on the heart where the towers once stood and added the words "more than ever." It was in New York Newspapers for weeks and shops and restaurants put the full page sign in their windows. We will start our day by attending mass and then spend the day together as a family as we watch the specials on television. I found this book at a thrift store in Laguna Beach on Thursday. How could I pass it up? Both my my kids read it the day I brought it home. 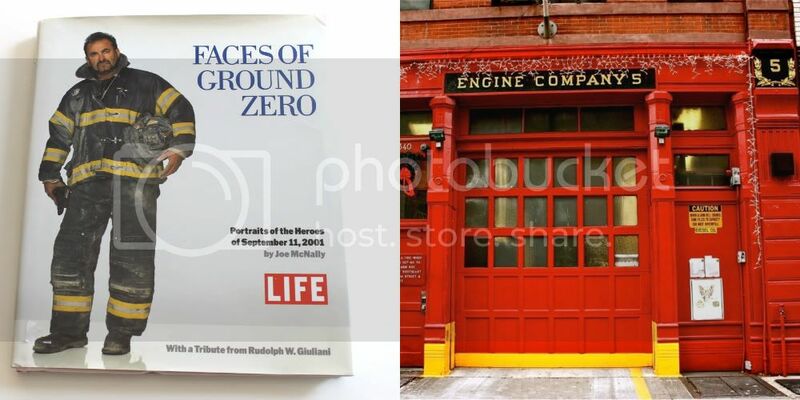 My nephew Ryan took this photo of Engine Co 5 in NYC during his first year at Fordham. He will be at Ground Zero on 9/11. We took this photo a year after 9/11. 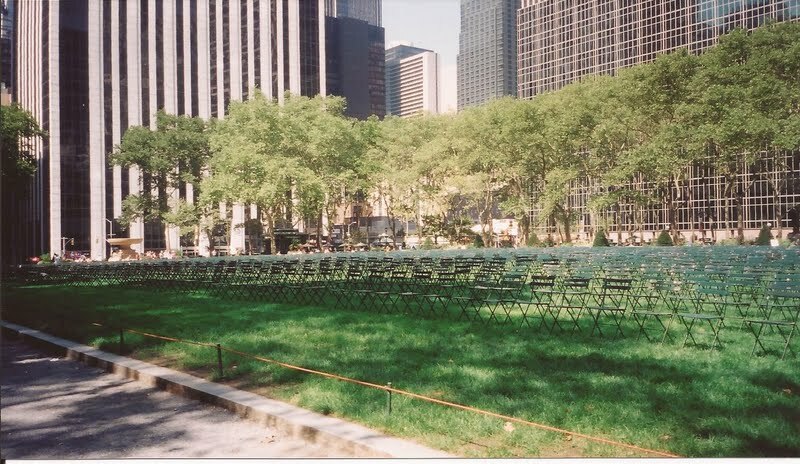 Empty chairs lined up in Bryant Park facing Ground Zero to represent the lives lost. New York City Fire Museum one year after the 9/11 attacks. 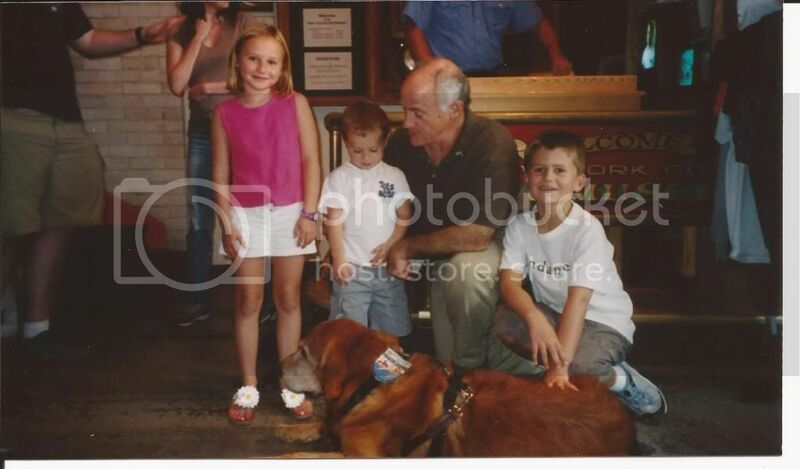 Madeline, Patrick and our friend Chase were able to meet one of the rescue dogs and his owner. I keep coming back to your post today. You did a really nice job. Thanks for sharing this, Annie. It's a day that we as New Yorkers and Americans have seared into our memories and hearts forever. The image of the soot covered commuters filing off the train in silence is haunting. As a New Yorker, I still think of that day as the worst day of my life. Annie, your personal story just gave me chills. I was in NY and at the WTC two weeks prior to 9/11. My heart breaks for those who lost a loved one that day and those that had to witness such a horrific event in person. Thank you for sharing your story. What a treasure of a blog! Your love and attention to detail is exceptional...thanks for sharing!